AutoTrim Pro is an all-in-one trim tab control system designed for boats of all sizes–packing in a boatload of essential features into an easy-to-use, space-saving keypad. AutoTrim Pro automatically levels the pitch and roll of your boat, adjusting your trim tabs to changes in vessel speed, sea conditions and shifting weight. Enjoy the convenience of riding in auto mode, or shift to full manual mode anytime. “All Up” and “All Down” Buttons allow for one-touch manual adjustments. OEM Customizable Response Time enables boat builders to pre-configure reaction time. Whether you have electric or hydraulic tabs, AutoTrim Pro can be added to all existing Bennett systems (with minor modifications in some applications), and most others as well. 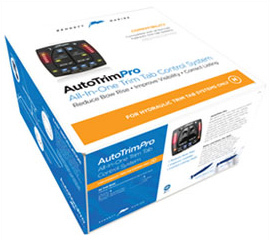 AutoTrim Pro is both 12 & 24 Volt capable. Download our Installation & User’s Guide for instruction on how to set up your new ATP system. If you need further assistance with installation, we’re just a phone call away. With plug and play waterproof snap-on connectors, assembly is easy and straightforward. Simply connect the helm display and the control unit. Boaters trust our brand. After all, we invented the world’s first adjustable trim tab—and never stopped pushing forward, always striving to make a better, more affordable system with maximum performance. Here’s what the boating community has to say about ATP. AutoTrim Pro is a performance upgrade you can actually feel, engineered to make your boating experience even more enjoyable. Adapter kit for dual helm sold separately. Our worldwide distribution centers offer customer support in over 60 countries. To discuss your specific application or to find a dealer near you, call us at 1-954-427-1400 or fill out the form below. © 2016 - 2019 Bennet Marine. All Rights Reserved. Website Design by Green Dot Advertising.